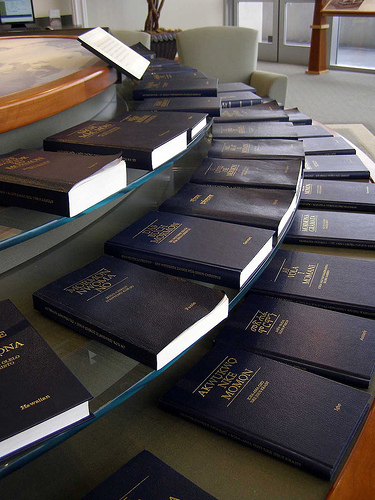 The Book of Mormon is published in 111 languages, and many of them are available in multiple formats online. In March 1830, 5,000 copies of the Book of Mormon were printed in the E. B. Grandin print shop in Palmyra, New York. From that humble beginning, today the Church prints over 3 million copies a year on large web presses. Over 180 million total copies have been distributed since 1830. Truly, this important witness of Jesus Christ is beginning to cover the earth. Today, all or part of the Book of Mormon has been translated into 111 languages. 90 are translations of the full book and 21 are translations of Selections from The Book of Mormon, which is approximately one third of the full book. The Book of Mormon is available in print in various sizes, bindings, and colors. American Sign Language is available online and on DVD. Braille files are online in English Braille and Spanish Braille. The Book of Mormon and the Bible are available in English in EPUB, mobi, PDF, and audio format for e-readers and mobile devices. You can request a free Book of Mormon at mormon.org/free-book-of-mormon.